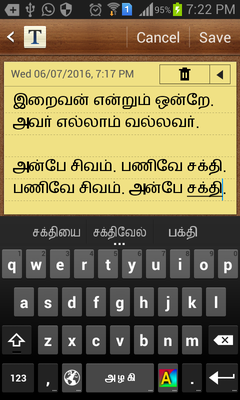 Click here to download and install the Azhagi android app from Google play store. Version: 14.27 (Second production release), 9 July 2018. 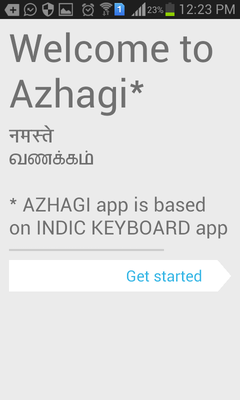 (*) Azhagi app has been built upon the award-winning Indic Keyboard app (Version 2.0.3) but 'Azhagi' app is NOT released under Apache License, Version 2.0 which was the license under which Indic Keyboard app was first released and it is the license under which it is currently maintained and distributed too. • Type ள், ற், ண், ஸ், ஶ் without using SHIFT key!!!!! • Type anywhere - Whatsapp, Facebook, SMS, etc. • Type using external keyboards too. • 100% free with 100% free support. "ஷிஃப்ட் அழுத்தாமல் 'ற்' அடிக்கறது சூப்பரோ சூப்பர்!" "The use of modifier 'lx rx' is really a powerful feature of Azhagi... Thumbs up..."
"Your mobile app is certainly a jewel in your crown"
"I can write in 4 languages - தமிழ், संस्कृत, বাংলা and in English in Android in one go"
So, first thing first. Thanks, in TONS, to Mr. Jishnu Mohan and other members of SMC (Swathanthra Malayalam Computing) for their 'Indic Keyboard' app because 'Azhagi' app is based on Indic Keyboard OPEN SOURCE Android app. Frankly speaking, my heart is overflowing with gratitude to Shri. Jishnu Mohan. Ever. Secondly, thanks again, in TONS, to Google for their AOSP (Android open source project) because 'Indic Keyboard' itself is based on the LatinIME keyboard of Google's AOSP only. NOTE: The screenshots below might differ in their form and appearance depending upon your 'phone model' and 'Android OS'. So, kindly consider the screenshots below as a general guidance only and not specific to every phone and Android OS. 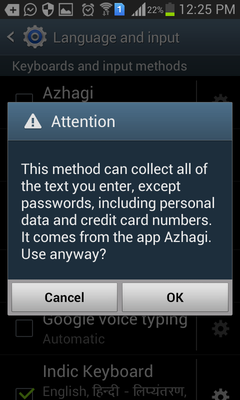 First of all, from your android device, visit https://play.google.com/store/apps/details?id=com.azhagi.inputmethod.azhagi to start installing Azhagi directly from the Google Play Store. Thereafter, you shall read the instructions below alone OR this YouTube video (narration in Tamil) OR opt to watch this youtube video (narration in Assamese) OR this facebook video (narration in Saurashtram) also along with my instructions below. My instructions below and the aforesaid 'short and sweet' videos would complement each other. The narration in the videos being in different Indian languages (Tamil, Assamese and Sourashtra resp.) should not be a barrier at all to you, becauuse the narration could be easily understood by the native speakers of any Indian language, as the accompanying video is clear-cut and the customary English words are spoken in English itself. Related facebook posts - post 1, post 2 and post 3. At the end of installation, I suggest you to click on Open . A 4-step 'SETUP WIZARD' will start. Click on 'Get started' in the starting screen of that 'setup wizard'. See screenshot below. Click on 'Enable in Settings'. Select 'Azhagi English'. i.e. 'Azhagi English' should get TICKED. The following CUSTOMARY dialog will appear. Click 'OK'. Click on 'Switch input methods'. Untick 'Use system language'. This is IMPORTANT. You do HAVE TO UNTICK 'Use system language'. Scroll down well and TICK 'அழகி - ஒலிபெயர்ப்பு' (and only 'அழகி - ஒலிபெயர்ப்பு'), if you are a long-time user of Azhagi. You need to tick 'தமிழ் எழுத்துப்பெயர்ப்பு' only if you wish to type in the way you type in softwares like ekalappai, nhm writer, etc. NOT otherwise. Go back to previous screen. Click on 'Finished'. 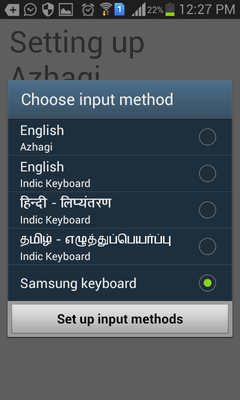 You are now ready to type alternately* in English and Tamil, ANYWHERE (Whatsapp, Facebook, Twitter, Gmail, etc. 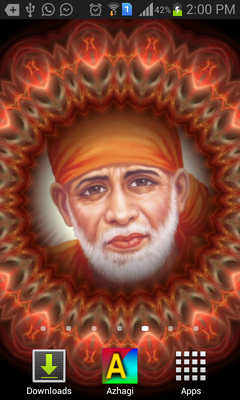 ), using Azhagi app. You have to press the GLOBE icon adjacent to the spacebar at the bottom row of the keyboard (see screenshot below) to alternate* between English and Tamil. (*) Assuming you selected only English and Tamil for your typing needs. 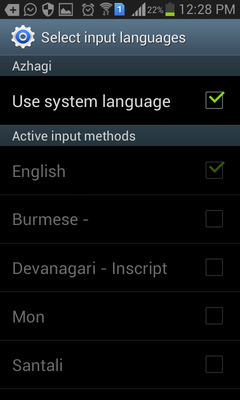 Otherwise, your selected languages/keyboards can be anything (Hindi, Urdu, Arabic, Telugu, Kannada, Malayalam, etc.). You have to press the GLOBE icon to move through your selected languages/keyboards. The same above screen in a different THEME below. 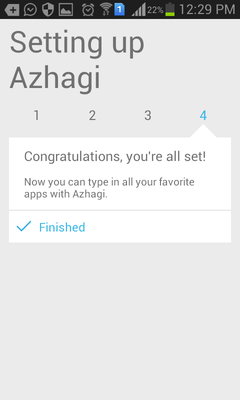 If you did not complete the installation by going through the 4-step setup process as described above, then you can click on Azhagi's icon in your Phone's home page and effect the above steps. For further help, if any, kindly write in https://www.facebook.com/groups/Azhagi (Azhagi's Facebook Group). If you are a regular user of various Indic IME (input method editor) apps, you would have selected the right languages and input methods during the 4-STEP setup process itself. So, the following steps are for users who did not select the right languages and input methods during the setup process. The following steps assume that your requirement is just to 'type in English' and 'transliterate in Tamil using Azhagi's transliteration scheme', alternately. If your requirements are different, the steps are still the same, as below. You just have to select your own required languages and input methods instead of just 'English' and 'அழகி - ஒலிபெயர்ப்பு'. That is all. For example, you can select "தமிழ் - எழுத்துப் பெயர்ப்பு" also additionally, which will help you to transliterate in the way you do it in softwares like ekalappai, nhm writer, etc. Go to 'Settings->Language and input' screen. 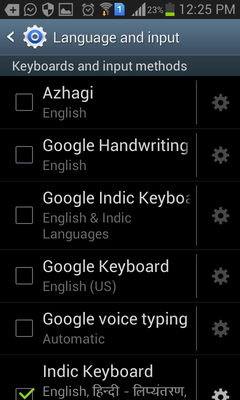 Therein, under 'Keyboard and input methods', for Default, choose 'English Azhagi'. 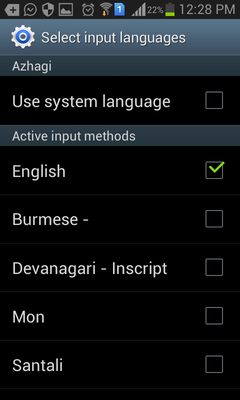 Thereafter, in the main 'Language and input' screen, you will see the checkbox near 'Azhagi English' ticked in green color. Click the gear icon at the right side of the ticked 'Azhagi'. Untick 'Use system language' if it is ticked. Thereafter, under 'Active input methods', tick English. Then, keep scrolling down until you see "அழகி - ஒலிபெயர்ப்பு" and tick it. Then, get back to the previous screen. Again, get back to the previous screen. Therein, you will see the ticked 'Azhagi' as "Azhagi English, அழகி - ஒலிபெயர்ப்பு". If you see this, it means you have successfully done the settings. Thereafter, get back to previous screen and then completely out of the 'Settings' screen. Start whatsapp (or any other app) and start typing in English or Tamil therein, by alternately clicking on the GLOBE icon. (^) In a nutshell, it turned out to be an himalayan task for me, extremely arduous, amidst my various obstacles, to bring forth 'Azhagi' for Android. An extremely big sigh of relief from me, as of Aug 2016. Thanks in TONS, once again, to Mr. Jishnu Mohan, SMC and Google.